Bill Hicks claimed to not understand why people went to the beach. To him it was just "where water meets sand." I agree with a lot of what Bill said but not that. There's something about the beach, two hours in a beach chair can go by in a flash. Where else do humans gather and just sit like we do at the beach? It's like one mass return to the womb. Mother Earth? Mother Ocean is more like it. 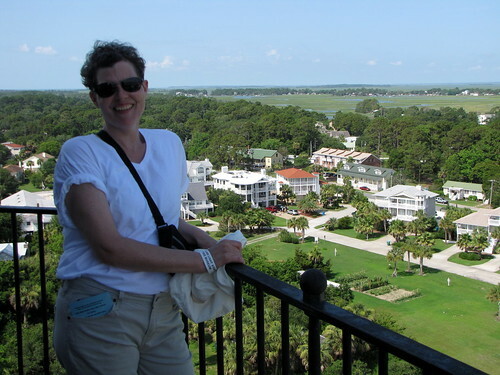 So, in late June Melanie and I went to Tybee Island for four nights and three days of leisure. Leisure is good. Although we did seem to spend a good deal of time walking, at a leisurely pace, of course. This is what we saw each day when we hung out at the beach, it's so peaceful. One mistake I made on this trip was bringing the wrong book. I brought a World War II novel that was highly recommended and I could not get into it. I thought maybe I was distracted by the beach but when I got back home I still couldn't get into the novel. Turns out, it just wasn't that great. Ah, well. 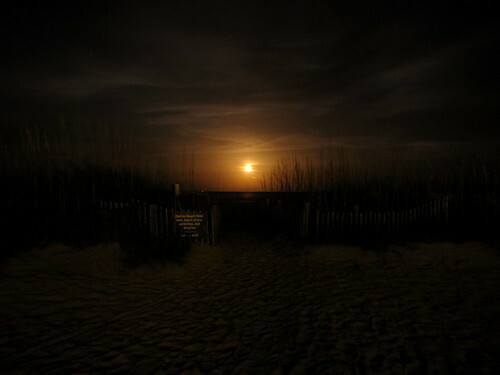 The first night there we went out to see the moonrise. It was the week of the so-called "super moon" and I was curious to see if it really did seem larger. It didn't but it was still beautiful beyond measure. 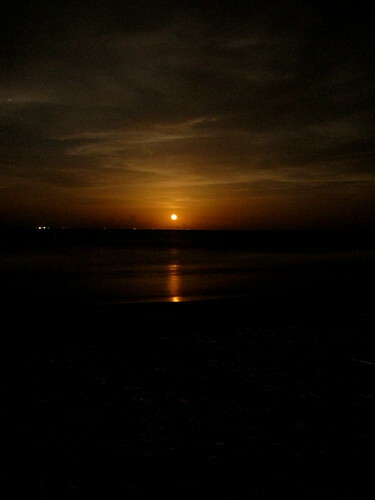 I had not seen a moonrise at the the coast before. I wasn't prepared for the amazing red colors. I don't want you to think we spent the whole time sitting in a beach chair listening to the surf while reading and soaking up the sun. We also took naps and even went sightseeing one afternoon. 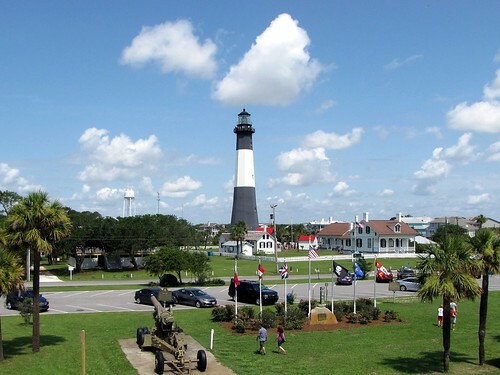 A short distance from the hotel where we stayed is the Tybee Island Lighthouse and Museum. 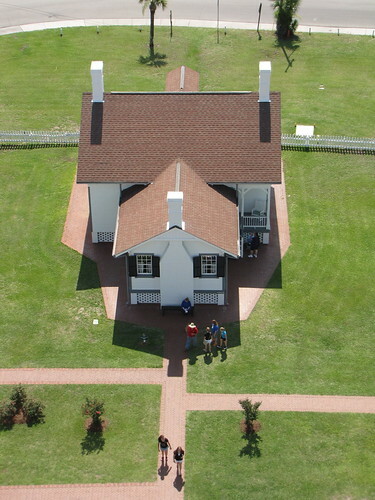 The lighthouse as it stands now was finished shortly after the Civil War and the lower first 60 feet are much older. I didn't know that before and I was, not really concerned, but aware that I was ascending a structure built over 150 years ago. How much longer will it stand, I wondered. Is it inspected? Do these retirees that run this place know what in the hell they are doing? But we went up and it was great. It's 144 feet tall and has an observation deck. With the low country being flat as a pancake you can see a long way from 144 feet in the air. Because the lighthouse is old and will probably fall over during the next big storm only so many people were allowed to enter at a time. The front was guarded by a tiny woman who really reminded me of my grandmother. Walking up 144 feet in late June in Georgia is not the most pleasant activity but we made it. We did pass an overweight woman as she was coming down and she was in as ill of a mood as anyone I've seen in a long while. Man, was she pissed. This was the line to get in. Normally, not as long, I think. We got there when a couple of tour groups arrived. Even with the line this long the wait was around ten to fifteen minutes which isn't too bad. 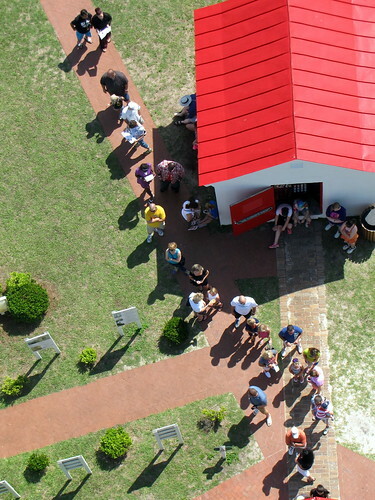 What is unique, according to the volunteers, about his light station is that several of the buildings used to support the lighthouse and the staff still survive in their mostly original state. This building is the main lightkeeper's home. Here is Melanie at the top. She was a little unsure about the climb but she made it up with no problem. Behind her you can see how amazing the view is. 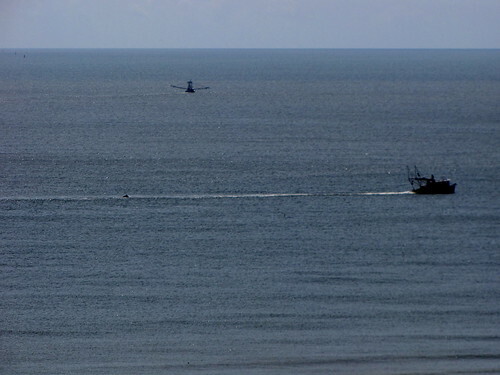 While we were up there a lady pointed out you could see dolphins trailing behind fishing boats, gobbling up scraps. You can see a fin in the shot below. 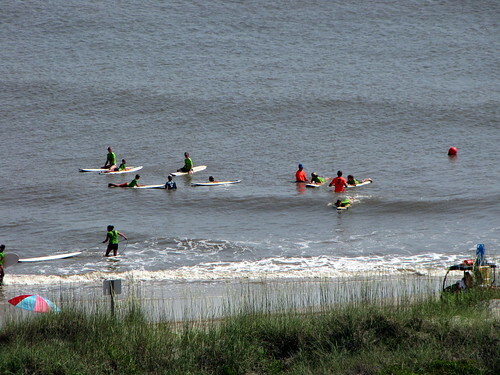 You also see surfers bobbing in the surf on the north side of the island. Near as I could tell surfing in the Atlantic Oceans consists of a lot of sitting on your board waiting for a wave that is never going to arrive.